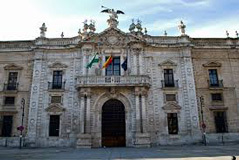 The University of Seville is a public institution dedicated to high education, in the city of Seville, the Community of Andalusia. Although their centers are distributed all around the city, its rectorship is the building of the Royal Tobacco Factory. Before becaming the University of Seville, it was the School of Santa Maria de Jesus, founded by the Archdeacon Maese Rodrigo Fernandez de Santaella at the end of the XVth century.